The following sermon makes the most sense if you heard the people at church sharing about attending Mennonite Native Assembly and Pauingassi Family Camp. But if you weren’t there, feel free to still read on. Several years ago, I was at a bonfire. Sitting in the dark, I ended up talking to somebody that I didn’t know. He was a Toronto Maple Leafs fan, so we ended up talking hockey for a bit. He sold car parts for a living, so we talked about car parts for a bit. And then he opened up his jacket and slipped his beer bottle into his jacket. Because obviously when we were talking about hockey and car parts, all I was really thinking about was the fact that he was drinking beer. But, I guess this goes with the territory. I work as a pastor, and people attach all sorts of ideas to that. And usually, if they don’t want anything to do with church, our conversations generally stop. But, I’ve figured out a solution to this conundrum. And now I haven’t lost a friend. Now, this is where it gets interesting, especially if they themselves aren’t really churchy people. Usually, we end up exchanging a bunch of questions to try to figure out some common ground. They ask, “How big is your church?” “Well, we have 140 active members, 70 active non-members, 70 inactive members, an average attendance of 160 some on Sundays, 150 mailboxes, about 40 kids, plus an unknown number of people in Steinbach who say that Grace Mennonite is their church but they’re not in our church phone directory.” Well, this conversation is going good places. So then I ask, “Do you go to church?” And if they don’t, then they look at me like I’m judging them, or that I’ve asked them a ridiculous question. And now, at this point, you should all be grateful that you get to answer the question of where you work with, “Teacher” “Accountant” “Nurse” “Trucker” “Carpenter” “Financial Adviser” because those conversations usually don’t end up talking about the Reformation and the Crusades and whether or not you can have a beer. But, what I HAVE discovered is that I CAN talk very bravely and freely about us here at Grace Mennonite trying making spaces to listen to other people’s stories, both within our congregation and in our world. And I think that us participating in Native Assembly and our partnership with Pauingassi First Nation is part of us seeking a posture of humility and learning to listen. It was by listening to others talk that relationships of deep respect began to form. Or one could also think of the assembly as a gathering of gift giving—offering each other the gifts from our places and thereby also offering each other the gifts of our identities—extending relationship and kinship to each other. Our lives are a gift. A gift to be both given and received. And in order to form relationships, in order to share our lives as gifts, we first have to show up and listen to each other. That sounds an awful lot like Jesus, the guy who eats with sinners, doesn’t it? It sounds like the guy who made the outsiders, the outcasts, those on the margins feel like the most important people in the world. There’s an emphasis on relationships and love, and that any conversation about faith and morality and justice and homelessness best happens in the context of relationships. I think that we all know this. We hate it when people we don’t know come to our doors to tell us what to believe and how to live. It’s only in the context of loving relationships that most of us are willing to entertain the idea of changing behaviours or worldviews. And even if we end up disagreeing, that loving relationship is still there, and isn’t that more important things anyways? Here in Canada, we’ve been seeing many stories of First Nations hit the news. 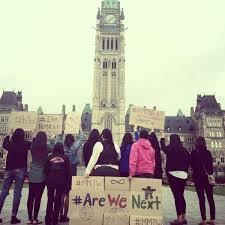 Between the almost 1200 murdered and missing aboriginal women, the Truth and Reconciliation Commission, the Idle No More movement, the anti-fracking protests, the movement to remove the mercury dumped in the river in Grassy Narrows, I’m going to venture to say that many of the relationships between First Nations and the rest of the country are a bit broken. In some ways, this broken relationship a bit subtle, but in other ways, not so much. Just go and read the online comments on any news article that talks about First Nations. Or better yet, don’t. Don’t read the online comments. Never read the online comments. There is something seriously broken in this relationship. I don’t have a lot of answers on how to fix it, but I do know a really good first step. Show up. Listen. Laugh. Learn. Love. Simply be together. If any work towards reconciliation is to happen in Canada, it’s only going to happen in the context of meaningful, healthy, relationships. So we continue to show up, and listen, and try to understand. “A commitment to change will also call upon Canadians to realize that reconciliation is not a new opportunity to convince aboriginal people to “get over it” and become like “everyone else.” That is, after all, what residential schools were all about and look how that went. I hope this is what we are trying to do here at Grace. I pray this is what we are doing here at Grace. Because this is what who we believe Jesus is. This is what we believe Jesus did. That we continue working towards meaningful, healthy relationships with each other and with others. I believe in reconciliation. I believe that God is busy restoring the world. I think a bunch of you did when you made our mission statement years ago when you said that we would accept and care for all people. And I think it’s the way of Jesus. May we all seek to make space for one another’s stories, because this is the way of Jesus. The following was preached at Grace Mennonite on September 14, 2014, based on Genesis 12:1-4. It was kind of a bizzare summer for me. On the one hand, I had a blast. 26 of us Gracers went to Pauingassi for our fourth family camp. My ultimate team had our best summer yet, finishing with a record of 14-4. Ash and I coach the high school ultimate team out of Grunthal, and we finished 11th in the province, which is quite amazing since we’re from Grunthal. My family went fishing way way up North to Ashley’s family’s fly in cabin. We were catching a pickerel every 0 to 15 seconds, and we managed to come across a dead moose floating in the water. And yes, a quick chainsaw later, I took the antlers home with me. My family also went rock climbing and canoeing. We swam in our kiddie pool and went to the splash park. We barbequed and deep fried and went to the beach and slept in our tent. Looking back, I don’t really know how we managed to do that all, considering my kids are 1 and 3 years old, but we did. It was a lot of work, but it was awesome. And then, on the other hand, when I tuned into what was going on in the world, I was often left speechless. The ongoing conflict between Russia and Ukraine. The violence committed by ISIS in Iraq is some of the worst we’ve recently seen. Violence erupted in Israel and the Gaza strip, where we ended up talking about the number of children killed. We read about the death of an unarmed African American teenager in Ferguson, Missouri, and then the pictures of the protests and the police. It looked like a war zone. And then recently, here in Winnipeg, police found Tina Fontaine, a 15 year old aboriginal girl murdered and dumped into the river. It’s often overwhelming, isn’t it? We don’t know what to do. My response is often to turn off the news and go play with my kids. These scenarios are huge, they’re complicated, there are centuries of history behind them, and there are no easy answers. And the worst part is that if I looked back to the summer of 2013, I probably could have made a similar list. And next year, I will probably be able to add to the list. These stories of violence and evil occur over and over and over again, year after year, century after century, millennium after millennium. Over and over and over again. Genesis 4:8 – Cain attacked his brother Abel and killed him. Genesis 4:23 – Lamech says: I have a killed young man for wounding me, a young man for injuring me. Genesis 6:5 – The Lord saw how great the wickedness of the human race had become on the earth, and that every inclination of the thoughts of the human heart was only evil all the time. Genesis 6:11 – Now the Earth was corrupt in God’s sight and was full of violence. And this is just the first six chapters of Genesis! Over, and over, and over again, we return to this narrative of evil, of violence, of oppression, of doing harm to your neighbour. These huge, complicated, narratives that are centuries old. I can’t tackle all of them this morning, both the Genesis stories or the ones in past few months, although I wish I could. But we can look at one of God’s response in the book of Genesis. And God’s response in this text of Abraham and Sarah is simple: Try again. Try again with some new people. Try again. God started with Adam and Eve, and that didn’t work out as God had hoped. Then God tried starting again with Noah, and that didn’t work out as God had hoped. So what does God do? Try again with Abraham and Sarah. Because to understand how God works in the Old Testament, to understand how God works in our world, we need to understand that God always works through humankind. Through kings and peasants and our seniors and our children and through people with lots of money and with people who don’t have lots of money, God is always working through us. God partners with us, and is always inviting us to let the reign of God rule in our hearts and in our lives. This is the call of Abraham in Genesis 12. This story starts off with something we all want – God on our side. And then it moves into familiar territory – God against our enemies. This is an ancient narrative that everyone would have known, and still knows. God is on our side, and not their side. But then, our familiar narrative is turned on its head. Everyone will be blessed through you. There is something different about this God of Abraham. I will make your name great, you will be a blessing, and all peoples on earth will be blessed through you. God’s blessing, God’s favour, is for everyone. This blessing, this sending, this invitation goes beyond the tribalism of Abraham’s world, it goes beyond “looking out for me and my own”, it goes beyond only caring for people from one country or one faith or the one football team. It’s about everybody. It’s about God choosing to work with people to bless the world. Which brings us back to this summer, and much of violence and protests that filled our news feeds up. How does God work with people to bless the world when it’s so messy and violent? I saw a cartoon from www.reknew.org that best explains some of what’s going on in the world. You can also make the big fish say “There is no oppression,” the medium fish say “There is some oppression,” and the little fish say “There is lots of oppression.” And when we start to look at the world through this lens, I think that things start to look a little bit different. Any time there’s violence, a conflict, a protest, an uproar, we need to ask some questions. We need to ask, “What the uproar is about?” “Who’s doing the yelling?” “Why are they yelling?” And we need to ask, “What kind of fish are they?” “Are they the big fish, or the little fish?” Because these questions matter. Now, ask yourself, Who’s the big fish in this story? Who’s the little fish? And what is each fish saying? “It’s BS. They don’t even know what they’re fighting for.” “It’s just a lot of misplaced anger.” “The protesters like seeing themselves on TV.” “It’s just a small group of people making trouble.” “The kid wasn’t really innocent.” “People are just taking the opportunity to satisfy their desire for junk.” “Basically, they hate whites. It’s reverse prejudice.” Whoa. Same conflict. Different fish. Different stories. Let’s look at another story, one that’s a lot closer to home. This summer, the police in Winnipeg found Tina Fontaine, a 15 year old aboriginal woman, in a plastic bag floating in the river. She now joins the almost 1200 murdered or missing aboriginal woman in Canada since 1980. Aboriginal women make up just 4% of our population but make up 16% of all female homicides and 11% of missing women. These numbers show that something is seriously wrong in Canada. Who’s the big fish in this story? And who’s the little fish? And what is each fish saying? Well, let’s start with the biggest fish of all. Our Prime Minister Stephen Harper said: “I think we should not view this as sociological phenomenon. We should view it as crime.” Well, half of what he said was right. It is a crime. But the answer isn’t an either/or, it’s a both/and. Maybe we should also try to figure out why we indigenous women have such a high homicide rate? I understand that I’m just scratching the surface of conflicts and narratives that are centuries old. I get that. But when listen to what some of the voices are saying, we see a remarkable difference. You by all means can criticize me for being slanted or biased or only picking up the extreme voices and not listening to the moderates. You’re probably right. Because I have. But that’s also the point, because generally, the people who are the big fish, the ones who think the world is just, who think there isn’t oppression, think that the little fish are making a big deal out of nothing, and they don’t want to hear the voices of the little fish. And then the louder the little fish shout, the more the big fish does to ignore them, vilify them, degrade them, and make excuses. I think that being a big fish, being a center of power, blinds one to the voices and perspectives of the little fish, those who find themselves marginalized. Who’s dying sooner than they should? Who’s dying at a greater rate than the average population? Whose children are being killed? And here we are, back to the story of violence that has been told for thousands of years since Genesis. Over, and over, and over again, we return to this narrative of evil, of violence, of oppression, of doing harm to your neighbour. These huge, complicated, narratives that are centuries old. Where is God in all this? What is God doing in our world? Well, I think that God is in the business of working with humanity, no matter how messed up the world is, or how messed up we are. I think that God is in the business of blessing the world, all the world, and invites us to be a part of it. And this story of God blessing people to bless the world repeats continually over and over in us. Overwhelming at times? Yeah. And humbling. And hard. I think we start with ourselves, and acknowledge that we have the ability to do evil, that we are part of these stories, and that we ask God for help and healing, because I really believe that to the degree that we are transformed as followers of Jesus, the world around us is transformed. And I think that we need to intentionally participate in a community where we not only listen to other voices, but also seek to pray for and love all the voices. I think we need to participate in a community that offers an alternative narrative to the violence and racism and marginalization in our world. I think we need to participate in a community that believes God’s blessing isn’t meant only for a select few, but for everyone. I think we need to participate in a community that shows the world that maybe, we can listen to many voices and seek the common good of all. I think we need to participate in a community where we can live in the hope and the dream that another world is possible. The following is a sermon preached at Grace Mennonite on September 7, 2014, based on Genesis 6:9-22; 9:8-15. 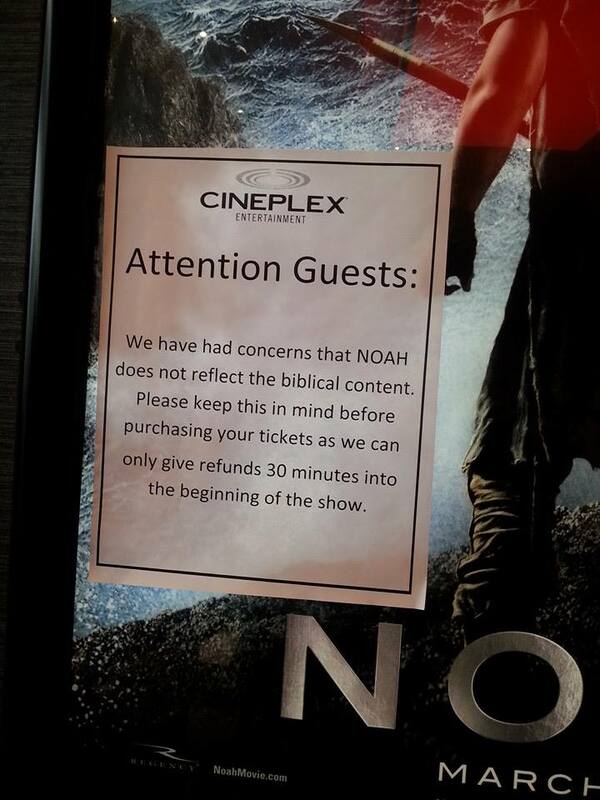 A few months ago, the movie Noah came out. Many of you have seen it. I have not. But I’ve loved listening to everyone’s reactions to it. Some people loved it. Some people hated it. Some people thought it was quite an interesting interpretation. Some people went back to Genesis to re-read the story to figure out what’s actually there and what’s actually not. One of my favourite responses was this one: It’s a sign put up at a movie theatre in Abbotsford. People saw the movie and asked for a refund because it they thought it didn’t follow their understanding of 3 chapters in a book written thousands of years ago. I get it that we sometimes end up seeing movies we don’t like, but to ask for a refund?!? That’s awesome. I guess there are a bunch of thrifty Mennonites in Abbotsford or something. I love it. I haven’t seen the movie, so I’ll stop talking about it, but if you have seen it and want to talk about it, you can talk to Mel. He’d love to talk to you about it. But, movie aside, we still have this story of Noah and the Flood. God saw how wicked the humans were, regretted making them, and wants to destroy them. God regretted making us? I think that is one of the worst things we can say to our children. “I regret having you.” That cuts deep. Don’t say that to your kids. But here God regrets us. So he seeks to destroy us. Which raises big questions as to what kind of God is this? But we’ll get there in a bit. God wants to destroy humanity, except for Noah and his family. He tells them to build a boat and fill it with animals and then go for a 40 day boat ride with them so they can survive the flood. After we’re done reading this, we start asking some interesting questions: How did he feed the animals? How did he fit sixty thousand vertebraes on the ark? Did Noah have the one million species of insects on board? How did animals reproduce if there were only two left of a kind? Did the baby animals end up mating with their siblings? What if one platypus went this way and one went that way and they never found each other again? What if right out of the ark the wildebeest gets eaten by the crocodiles? And the 40 days of flood water… Was it salt water or fresh water? And an elephant poops 300 lbs a day, so times by 2 elephants… 600 lbs a day, times by 40 days… Did Noah and his family actually shovel 24,000 lbs of elephant poop off the side of the boat? Oh, so many questions to ask. But as much fun as it is to think of all the theoretical problems of Noah’s Ark, I think if we do this, we miss the point of the story. I think that in our effort to take the story seriously, we often end up taking literally, because when we read history text books, that’s what we do. This historical event happened, Alexander the Great went there, this volcano erupted, some army fought some war, Louis Riel formed a province, and then in the summer of 2014 we all found out that RM of Hanover was never really dry in the first place. But here’s the thing about the story of Noah and the Flood. It was never written to be a historical depiction of what happened. There wasn’t anybody there writing down what Noah said to his wife about the smell on the Ark. The flood story, the version that we have today in our Bibles, was most likely written down thousands of years AFTER the event happened. That’s like you and I trying to write the history of the Roman Empire. Considering that I can’t remember people’s birthdays without Facebook reminding me, some of those details might be a bit blurry. But that’s okay, because you wouldn’t expect me to get it all the details right as to what actually happened, right? But what you WOULD expect me to do is to get the important parts right. And THAT’s why we are reading the story of Noah and the flood to this day. Because there’s something important in there that we’re not supposed to miss all these thousands of years later. What is that important thing? Well, did you know that there are flood stories in other Ancient Near East religions? The Sumerians had flood stories, the Mesopotamians had flood stories, the Babylonians had flood stories… Back then, everybody had flood stories. Some of the stories even had people building boats to escape the floods. Everyone was talking about floods. Because floods were uncontrollable. Floods were unpredictable. Floods killed. Floods were bad. And how would a person back then make sense of these killer floods? Well, the Gods sent them. The Gods sent the floods as part of their anger. God sends a flood because God is mad. Think that sounds stupid? Yeah, it does. But to this day we still hear people attributing hurricanes and tornadoes and disease and death to God. People call it a warning, or a wake-up call, or a punishment for unconfessed sin. Some still call it God’s wrath. The insurance companies call it an act of God, and then you find out you’re not covered. This line of thinking makes God sound petty and vengeful and is actually more about karma than grace, but we hear it all the time. The same is with the flood stories we find in other Ancient Near Religions: The gods are angry, and the result of their anger is chaos and death in our world. And that’s exactly how the flood story we find in Genesis starts. God is angry with humankind, God regrets making them, God is going to destroy them all with a flood because of that anger. Everyone had heard this story before. They all knew how it was going to end. But then, in this flood story, something different happens. Something monumental. Something so important that it was probably worth writing down so that we’d never forget it. Gen 9:11 – I establish my covenant with you: Never again will all life be destroyed by the waters of a flood: never again will there be a flood to destroy the Earth. And then the rainbow is the sign of this covenant. “This was not how people talked about the gods. The gods are pissed off-that’s how people understood the gods. This story is about a new view of God. but a God who wants to live in relationship. So yes, it’s a primitive story. It’s a really, really old story. It reflects how people saw the word and explained what was happening around them. This is the important thing. This God, Noah’s God, our God, is about relationship. This God, as Father, Son and Holy Spirit, IS relationship. This God is in relationship with God’s children here on Earth. This God invites us to live in relationship with each other. This God invites us to relationship with our neighbours, both near and far, the ones like us and the one’s not like us, the ones we love and the ones who drive us crazy, the ones we’ve known for years and the ones who sit near us in church but we still don’t know their names. We are invited to relationship. One of the things that I love about Grace Mennonite Church is that there is a high emphasis on relationships. That emphasis has been there since its beginning, and continues to be important for us over 50 years later. We value relationship. Last week, Mel invited us to remember it is God that we serve when we go to work. Next week, we’re going to be looking for the work of God in the face of injustice, violence, and oppression, and invite ourselves to find out where we fit into that story. But this week, the invitation is for us to enter into deeper relationships with one another and our world. Next week is our fall fellowship lunch. Come downstairs and sit with someone you don’t regularly sit with. And if you can’t come next week, October 19th is our Thanksgiving lunch as well. The Sisters of Grace group is planning a women’s retreat in the fall. Take the risk and sign up, or even better, sign up and invite someone who isn’t going. If you consider yourself a young adult, in November we’re hosting a Sabbath weekend of prayer, silence, and contemplation, plus we eat good food. If you love to serve, Mel will be organizing a week of service with Mennonite Disaster Service. Obviously helping rebuild homes and lives is a highlight, but so is spending time with people from Grace whom you might not otherwise. Our Spiritual Guidance team will be hosting 6 evenings starting mid-October of guided discussions with guest speakers as we talk about sexuality. Come and listen and learn and share and ask deep questions as a church community committed to following Jesus together. It’s harvest time. A great group of faithful gardeners always have room for more hands as they harvest a crop of vegetables for Soup’s On Wednesday nights. We are hoping to host a group from Pauingassi again this fall. Come and listen and learn and laugh and adopt a posture of humility with our First Nations brothers and sisters. Budget some extra time to spend here at church on Sunday mornings, grab a cup of fair trade coffee, and join the conversations we often have as part of Christian Formation time. Or at the very least, grab your coffee and be brave and say hi to someone that you don’t know very well. Join up with the community of people who make sandwiches for school kids on Monday mornings, or help cook food on Tuesday afternoons for Soup’s On, or join up with the groups of Gracers who create space for people to encounter God at nursing homes. Sure, you get to “do” some good things. But you also get to do it with some pretty cool people. You get to invest in relationships. You’re invited to relationship with each other, as God’s church here. Because God invites us to live in relationship with each other. Because God is in relationship with us. Because God, as Father, Son, and Holy Spirit, IS relationship. Because this God, Noah’s God, our is all about relationship.